The “truth”; when it comes to our speech or rather how it can pour forth from our mouths; is too often distorted by simplicity and complexity. Simplicity in that the black and white thinking of man gives the illusion that there is only one way to view something. Complexity in that man-kind has rationalized and theorized “truth” into an oblivion of facets that many give up on trying to attain it. The Truth in man’s hands is more a cousin to deceit than a child of love. This is why I love the above scripture so much. It puts all speech into the Light of Truth. Keeping ones words from evil. Anything that does not do good, speak well, promote good, promote unity, cause grace. .. to flow from our hearts. This is evil. Another perspective is. .. anything that Yeshua or the Spirit wouldn’t say to the Father on behalf of another, these things should never darken the door of our own lips. Hate stirs up disputes, but love covers all kinds of transgressions. He who conceals an offense promotes love, but he who harps on it can separate even close friends. Now that you have purified yourselves by obeying the truth, so that you have a sincere love for your brothers, love each other deeply, with all your heart. More than anything, keep loving each other actively; Because love covers many sins. I must constantly remind myself that David, in the Psalms we read, is praying. .. having a conversation with God. Davids prayer here is concerned with what is between him and His God. What most do not know. ..because in this “closet” noone knows what he is thinking or praying or asking. At least when he wrote them. Now, of course, the whole world. .. generation upon generation has read Davids heart. But at the time he wrote this. .. it was an appeal to God and a conversation with God that was present and real to David. He wasn’t trying to “teach” or preach to anyone. David was a king. .. His speech was subjected to every kind of opportunity known to man. Privately and publicly he knew this area was the first place to seek God’s wisdom. Here is why. .. Yeshua (Jesus) Himself unmuddies the waters. Moreover, I tell you this: on the Day of Judgement people will have to give account for every careless word they have spoken; for by your own words you will be acquitted, and by your own words you will be condemned. In other words. .. how I speak of others, what I share about others is very very important to God. If I speak well of others. ..I reflect the heart of God and therefore am able to be free of ill speaking. Likewise how I refrain from speaking of others wrongs. Freedom from it touching me when others speak ill of me and freedom from condemnation that comes from having spoken ill of others. Freedom in the world of loving. .. able to be taught from the Lord how to love. Then, Yeshua, being the Truth is greater in me than myself. Grace covers my wrongs and through Yeshua living in me it covers all the wrongs I will personally encounter done to me, around me, effecting me. ..in all ways. I came across this great post on a blog and it gives one of the best examples of delineating the “whole truth” factor from the Truth wholely active as I have ever read. He who has lips…Let him speak or be silent. As The Truth would do for you before His Father. 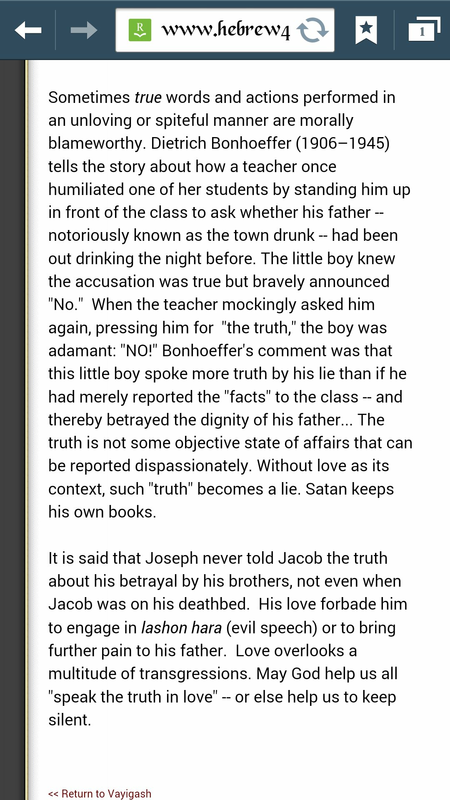 Notice in the story above the emphasis is on the relationship between a son and father? God has a special passion about this. The son that honors the father… no matter what. 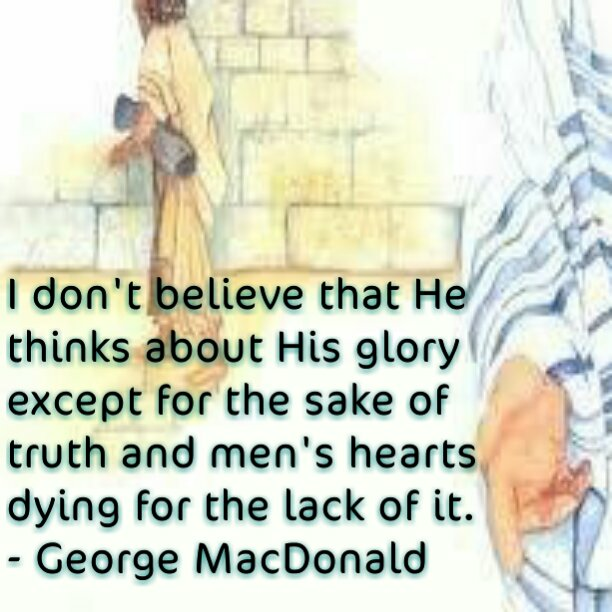 .. is to the glory of God. A word out of our mouth that keeps in mind our Father is their Father, is to the glory of the Son. Yeshua personified Love on the cross. .. covering all wrongs for all time with the Father. We are told He now stands before our Father with words of reminder of our acquittal. Along the road to that cross. .. He asked the Father to forgive (cover His eyes to the wrongs being done Him). Again on the cross He asks this. He’s still asking. .. we must assume all wrongs are being forgiven. .. and do justice by giving them very little “air-time” out of our mouths. 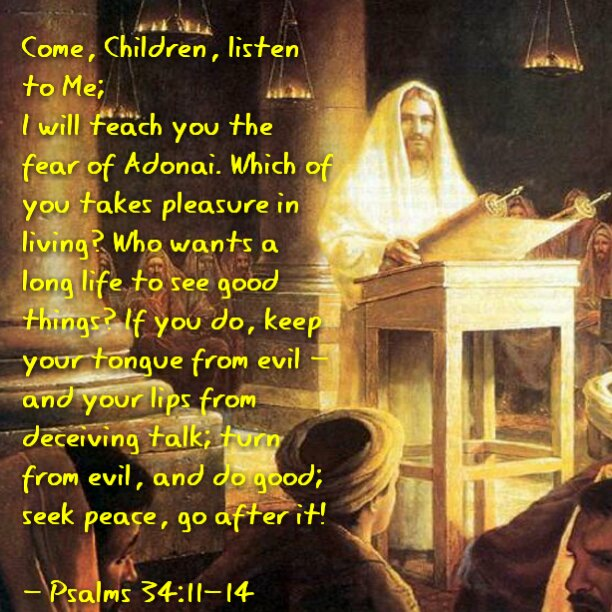 We enter into the Kingdom Yeshua brought with Him when our tongues shun evil and in its place do good. What is the difference between this complexity and simplicity and the first one I mentioned? God is at the center. .. not human reasoning. Human reasoning does what humans naturally feel inclined to do. The hallmark of God’s reasoning inside a human is the “going against the grain actions” of human nature. May He get the glory. .. in our speaking and our silence. May we know the Truth and be set free! So that we serve The Whole Truth and nothing but The Truth so help us God!